New 'Miracle Foods' Arrive; But What About the Old Ones? Quick response: there is no essential food — at least not for people over the age of about 2 years old. But the question keeps arising, most lately with respect to milk. According to vegans and less strict vegetarians, there's no reason we need dairy milk (from cows, that is). If you must have some liquid on your breakfast cereal, try soy, almond or rice "milk" they would say. And for people who are either lactose intolerant or have an allergy to milk protein, these can be reasonable substitutes. But not all substitutes are alike, and some can be missing some of the nutrients in which cow's milk is rich. Take calcium, for example. The greatest recommended amount of calcium is 1300 mg/day — for the 9-to-18-year-old group. That makes sense since those are prime years for laying down bone. 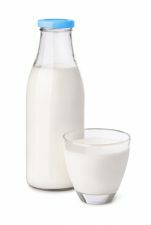 Milk — either whole or skim — contains about 240 mg per 200 ml (about 6.7 ounces). And other dairy foods, such as soft cheeses like Brie and Camembert, are good sources of calcium as well. What about non-dairy sources? Certainly dairy substitutes such as rice and soy milk could be good sources — but you have to check labels to be sure. Some fish, such as sardines in oil which typically include the bones, are also good calcium sources. About 2 ounces have as much calcium as the 200 ml of milk. As far as veggies go, spinach is a rich source but it's hard to absorb it because of the phytates in the greens. Other leafies, such as cress, are better calcium sources. The moral of the story (if you want to call it that) is simply that while there are a number of essential nutrients, there are no essential foods. Various cultures all over the world differ widely in their cuisines, yet manage to survive and thrive without a western-type diet. The Masai in Africa have a diet heavily dependent on milk and blood, while the traditional Chinese and Japanese diets lack any sort of dairy-derived foods. Dairy-based foods have been a major source of important nutrients in the American diet for many years, and sweeping changes to that should be made with the appropriate knowledge.